After I finished renewing my work visa at the immigration office in Tennoji, I decided that I would make a stop at Shitennoji Temple, which I hadn’t yet had a chance to visit. In an incredible stroke of luck, I happened to arrive during what turned out to be part of a four-day Buddhist celebration for the dead that coincides with the spring equinox. As with the Obon festival, this involves the relatives of people who have died making temple visits and having prayers read for the deceased. Inside the temple grounds the temple bells were being rung at regular intervals, people were bringing prayers to chanting priests, incense was being burned, and there was the feeling of a slow processional. But the mood was also festive and outside the temple grounds a lively flea market was being held with food stalls, antiques, and general bustle of activity. Because of the equinox, the pagoda, which is normally closed, was opened to foot traffic and so I took my shoes off and climbed the stairs to the top. The pagoda was rebuilt after being destroyed in WWII, and the interior feels strangely like being inside of a lighthouse. However, stored behind glass-windowed cases that line the walls of the entire height of the pagoda are thousands upon thousands of golden pagoda-shaped tablets, each separately numbered and carved with what I assume are verses of a sutra. The entire pagoda is a monumental sutra library and it’s dizzying to stand in the center, make the pagoda body vanish in your mind, and imagine the verses, on their small golden pagodas, spread out in the air like a book to be read. Shitennoji also features two incredible golden buddha statues in the kondo building, as well as a mural, painted in a style reminiscent of Indian art, that follows the life of the Buddha from birth until death, where he reclines, larger than life, smiling on his side. 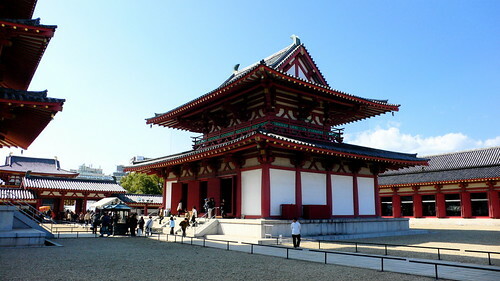 While these works may not be ‘original’ — the complex was rebuilt in 1965 — I think there’s far too much concern with ‘originality’ and ‘authenticity’ when it comes to temple and shrine complexes in Japan. 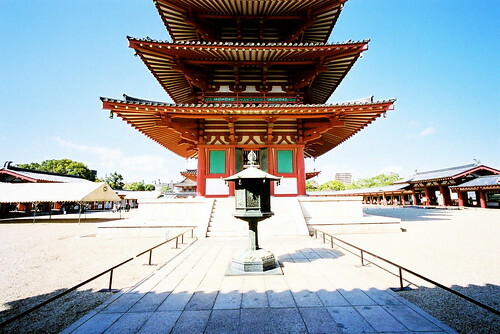 The fact is that Shitennoji — which was founded by Prince Shotoku in 593 and is considered by some to be the birthplace of Japanese Buddhism — is a living religious site that contains statues and murals that are impressive in themselves, whether they were made in 1235, or 1965. 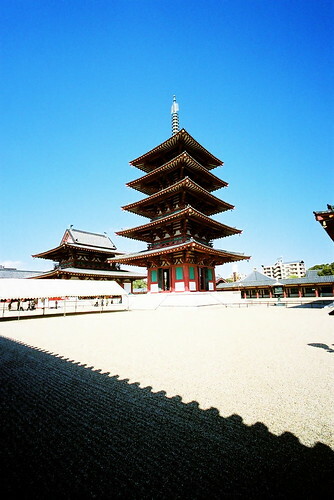 Another view of the pagoda at Shitennoji. One of the main halls at Shitennoji. If you look closely you can see the lines of people filing in to have prayers read for the dead. 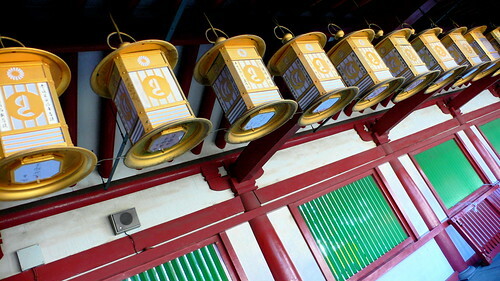 I think there was nothing special, except that we needed to bow to a buddism statue, called “Jibo-kannon” when walking through the gate of our schoolhouse at a Trii and that the headmaster was a buddhist priest of Shitennouji.